When you start to embrace situations with an unbiased mind and question the status quo, you realise that the knowledge you have gained is just a drop in the ocean. In a line, that is how I would describe my internship experience at Aditya Birla Group. I interned with Aditya Birla Group, Pulp & Fibre Business. The start was exceptional with a day which started by an overview by Chief Economist Mr. Ajit Ranade, from the human resource perspective having such a position in the organisation points towards visioning mentality. The day ended with a fun filled session by Mr. Akash Gautam, it was very the message came clearly that it is fine to make mistakes but it is important to try. I worked with Learning and Development team at ABG- Pulp & Fibre Business. I would say that I was able to touch on every facet of learning & development starting from content identification, development and delivery. The best part of my internship experience at ABG was my visit to the plants in Kharach, Gujrat and Nagda, Madhya Pradesh. The design of a technical competency framework required me to understand end to end processes and interview employees at all levels. The experience was exhilarating and I was only one who would be sad at 5 pm, when the plant siren brought it to a halt. The delicious food was soother but I would sleep with excitement for the next day, that I would meet a person who spent his entire lifetime in the very same place and does not have a flicker of regret. The internship was going, how it would go for any normal intern, you work hard for the glory letter at the end but the turning point came when I met with an accident, where I cheated death. The time was precisely right, it had been one month in the organisation and one month was left. I urged myself that I was going have only one summer internship in my management career, it is like first love and I want to make it a memorable one. I started slowing time, enjoying the interviews and identifying problems. I used to discuss the silliest of doubts with a person with whom I developed a mentor-mentee relationship, he was senior person in the organisation and he would appreciate me and prod me like how a little fledgling who is puffed air in the wings to make him believe that he can fly. I was completing my projects but with I was taking up work which I liked for example, creating a roadmap for a non-monetary reward framework for the plant set up. The responses I used to get at the ground were filled with verisimilitude, the management fundas which we come across were starting to gain meaning, and for example that majority of the answers for your recurring problems are with your people. I would like mention here, that when we read testimonials on summer internships experiences, it is generally about the organisation and the work you do. We forget to take about ourselves, I was able to feel vulnerable when I opened up myself for criticism, gather courage about things which were true about me and set up an improvement plan. I learnt that it is important to listen more than to speak, humility takes us places, it gives us more than we actually expect. There was change in others behaviours at work when I started practising it. The end of my internship was nearing and that one ‘pursuit of happiness’ feeling and it came at the last day, even after the usual working hours. My guide was the senior most person in my department and naturally was busy. I was adamant at getting my worked reviewed and he willingly stretched his schedule. He appreciated that I was able to deliver something was the need of the time. It just clinched the moment; I was able to add value. If I had to term the employee value proposition of Aditya Birla Group, it would be that the organisation cares and it does that through action. We had a presentation and an assessment centre on the last day, which involves feedback from top leaders in the organisation projecting the importance they gave to the interns at work. 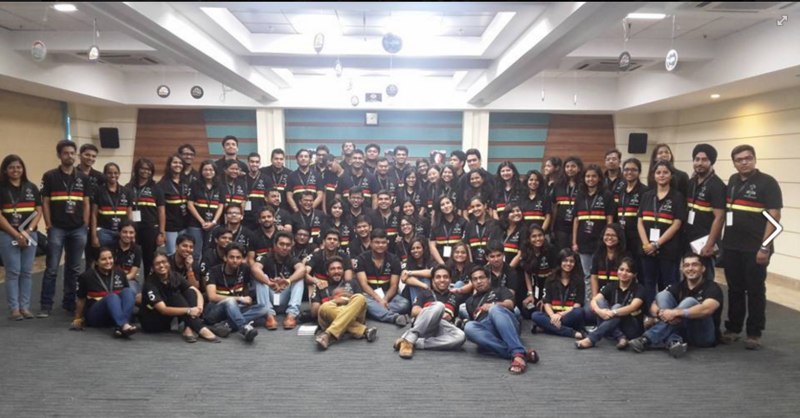 In the end, I would say it is the people who make the organisation, finding a mentor at Aditya Birla Group made a memory I would cherish for long and passing by the ABG, Worli office I would sigh in my heart, “Boy! That was some hell of a time”.